I have a need to organize the world. In my four years in as an angel investor and one as a VC, I’ve realized the world of startups and venture investing is pretty noisy and ambiguous, which is difficult to organize. But there has to be an order, how else can one make a successful career of venture investing or entrepreneurship in startups? Without some structure, it is simply just a gamble. Below is my framework for thinking about digital startup business models. This is based on the 500+ startups I’ve seen over the last few years. The framework is still evolving with my data set and, frankly, I am young and learning. I think about businesses models as a vertical line connecting the customer to profit. The business strategy is where and how the entrepreneur chooses to play on each of these dimensions. The spectrum of where and how to play are captured in the full framework below. There are many different ways to create and monetize a valuable service for customers, depending on type of customer. 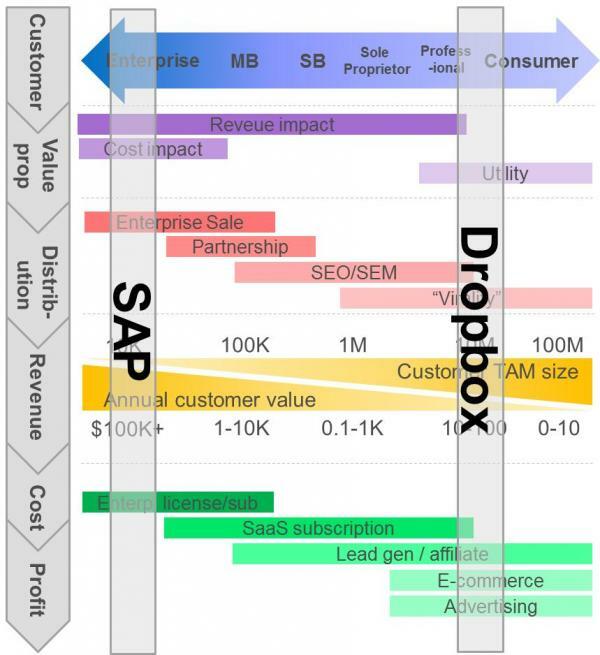 Implicit in this figure is that a vertical line represents a set of strategic choices on each key dimension that constitutes a potentially winning business model. Let’s get tactical. Below are highlighted two particular cases, SAP and Dropbox. SAP sells to enterprises – one of the few cases where cost benefits are an appealing value proposition. An SAP sale is a long, tedious and expensive enterprise sold into a market comprised of the top 10,000 businesses in the world. But the relatively small number of addressable customers and long sales cycle are justified by a very high ticket price. Dropbox is on the other end of the spectrum. Does Dropbox save consumers and small businesses cost or drive revenue? Yes, maybe, but mostly Dropbox just makes life less annoying with its utility. Dropbox was distributed virally. The number of endpoints in the addressable market is huge, offset by a monetization level through SaaS subscription that is very low. Both of these companies are incredibly successful because their strategic choices have created a strong business model. So now you see how the framework works. I meet many startups whose approaches are off – sideways Ms, sideways Vs, forward slashes, back slashes, etc. For example, a backslash (\) doesn’t work because ticket price is too low to support a long sales cycle and small number of addressable endpoints. It doesn’t mean the business can’t be successful, just that tweaks are needed. When I meet with a startup I check it against this framework in my head. If the line is not vertical, or even close to vertical, my feedback centers on the deviations. 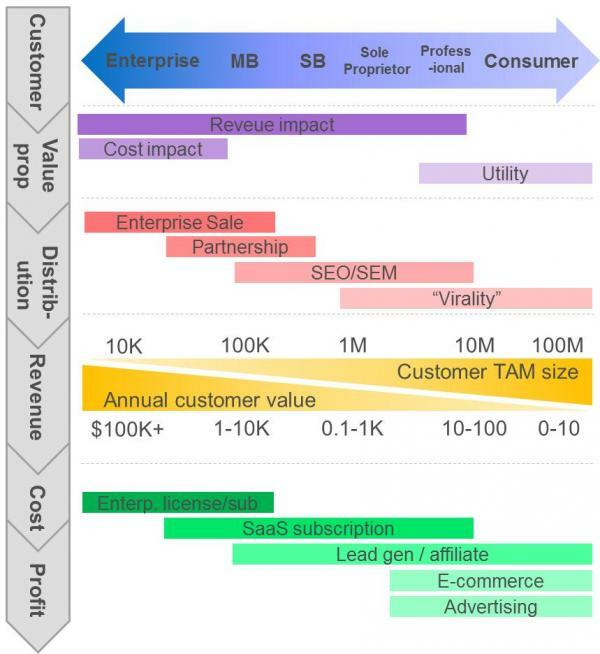 Cost is a tough value proposition: Take a look at the value proposition dimension. You will notice that cost (eg, cost savings) doesn’t extend to the right beyond medium sized businesses. So all to you startups selling into the cost side of SMB, professional and consumers’ P&L, good luck. It is a tough road. Not impossible, but tough all the same. It is very difficult to get SMB or professionals’ attention by saying, “hey, you know that line item that is 10% of your cost structure? I can save you 10% on it.” Snore. That is 10% of 10%, or 1% to the bottom line. They would much rather spend the same time learning and investing in a way to raise revenue 5%! A business can move right to left, but not the other way: Dropbox is a great example. They entered the professional and consumer markets and are slowly working their way left, with increasing monetization. I see this strategy a lot, and I like it. The older generation of VCs calls it the Webex strategy. But how many companies have you seen move left to right? What enterprise software companies have started delivering and monetizing great consumer apps? You will notice this framework doesn’t fit two-sided networks: I suppose you could stick a mirror at the bottom and reflect it to achieve a two sided framework. The point is that two-sided networks are HARD. I have seen a ton of “first we’re going to be wildly successful in B2C, collect a bunch of consumer data via an app and then sell it to businesses B2B.” Just being wildly successful in B2C is hard enough without having to pin monetization on being wildly successful in B2B. B2C2B2B is a bad idea. Please spread the word. But don’t confuse Dropbox or Facebook for two sided networks. They are networks, but they’re primarily one-sided. Members of the same side create value for each other. Those fit this framework of necessity and efficiency. Making strategic choices to fall close to vertical within this framework is necessary for success, but it is not sufficient. A successful startup also needs a killer value proposition and incredible management. And never forget the competition.